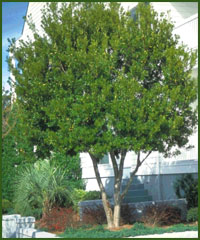 Comments: Southern Waxmyrtle is an evergreen shrub or small tree. Its leaves are fragrant when crushed and are an olive green color. If the plant is a female it will produce grayish white bayberry scented fruits that are covered with a wax which is sometimes used for candle making. The Southern Waxmyrtle makes for a good specimen, screen, small tree, or hedges and has a tolerance to drought, salt, sandy soils, wet soils, and some alkaline conditions. Myrica cerifera is a fast grower reaching a height of 15-20 feet tall and 15 feet wide so give it plenty of room to grow and spread. This plant is native to Texas.